“Jan W. Thomsen captivates the physics students when he takes them into the world of quantum optics and with his great enthusiasm and energetic demeanour he manages to create a learning atmosphere where students can strengthen their physical understanding of waves and electromagnetism,” reads the justification from the physics students and the teaching committee at the Niels Bohr Institute for recommending Jan W. Thomsen for the Faculty award as Teacher of the Year. Jan W. Thomsen captivates the physics students when he takes them into the world of quantum optics and it is impossible to not get carried away when you are met with world-class experimental craftsmanship, says the physics students in their recommendation of Jan W. Thomsen for the Faculty award as Teacher of the Year. It is this extraordinary effort and incredible focus on the students that the Faculty is now honouring by giving the award as Teacher of the Year at SCIENCE 2016 to Jan Westenkær Thomsen who is also described as a source of inspiration and an example for other teachers in the future. Jan W. Thomsen receives the award as Teacher of the Year at Science Faculty, 2016. Jan Thomsen already knew he wanted to be a physicist in primary school. “School was fun,” he recalls, because while he was in primary school and later in high school in Allerød he carried out exciting experiments with a group of friends and read all of the physics books he could get hold of. Physics was what he wanted to do – what he was passionate about. As a result, he was focused and began to study physics at the Niels Bohr Institute at the University of Copenhagen right after high school. “Here I had Jens Martin Knudsen and Nils O. Andersen as teachers and they were both amazing teachers and talented physicists, so they have meant a great deal to me,” explains Jan W. Thomsen. He lives by the same principles that experienced back then, that if you take the students seriously, then they also take their studies seriously. Jan Thomsen received his masters in 1992, after which he went to Université Paris-Sud, Orsay in Paris, where he completed his PhD in’95. After that he returned to the Niels Bohr Institute for three years and then received a postdoc position at Utrecht University in Holland. Here he changed fields in quantum physics. 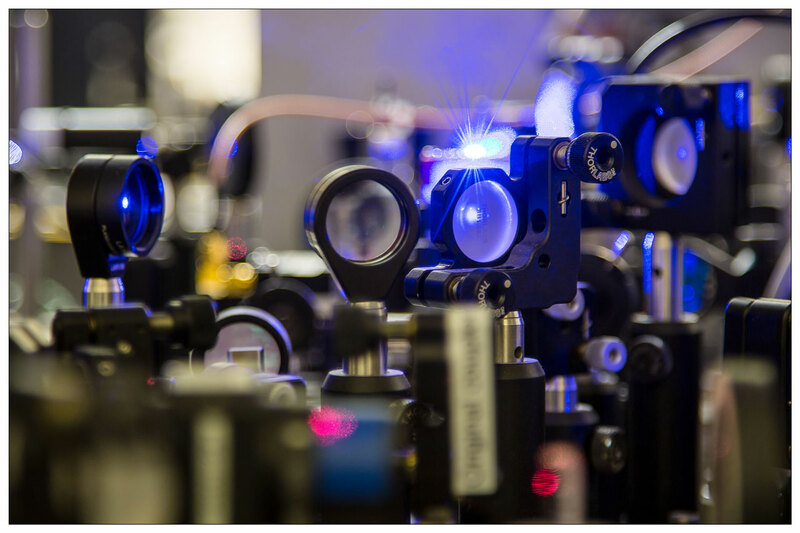 “I was captivated by working with ultracold atoms, that is atoms cooled to almost absolute zero at minus 273 degrees, after which you can control the atoms and use them to make super precise measurements. It was really exciting and this is the field I have worked in ever since,” he explains. He returned on a Carlsberg grant to the Niels Bohr Institute, where he received a permanent position three years later and is now head of the Ultracold Atoms research group. 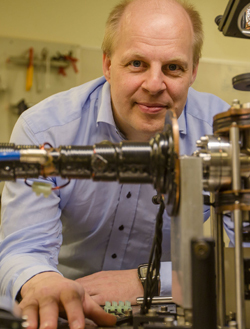 Jan W. Thomsen is working to develop atomic clocks based on ultracold strontium atoms. 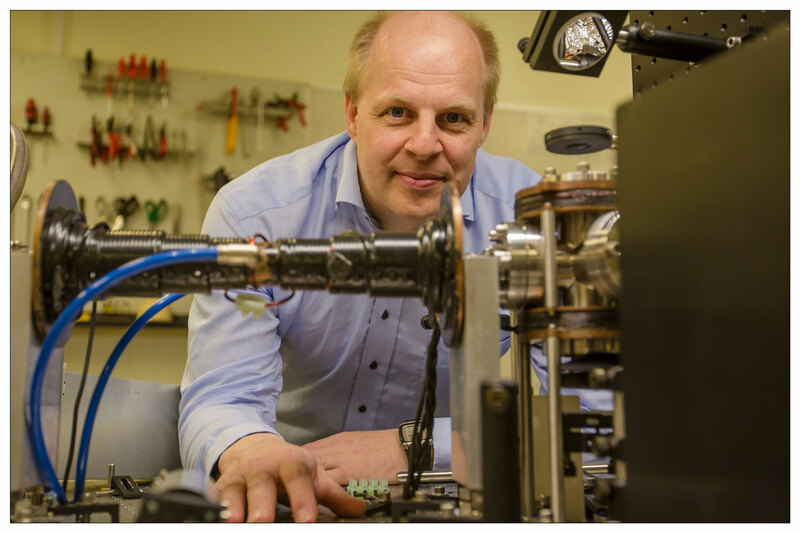 Jan W. Thomsen is working to develop atomic clocks based on ultracold strontium atoms in close collaboration with the University of Colorado, Boulder, USA. In an atomic clock, an electron is excited using laser light so that the electron hops between two electron orbitals and it is this oscillation between the two states that constitutes ‘the pendulum’ in the atomic clock. It is the clock’s counter. An atomic clock can be so ultra precise that it will only lose less than half a second over the entire lifetime of the universe, 13.7 billion years. 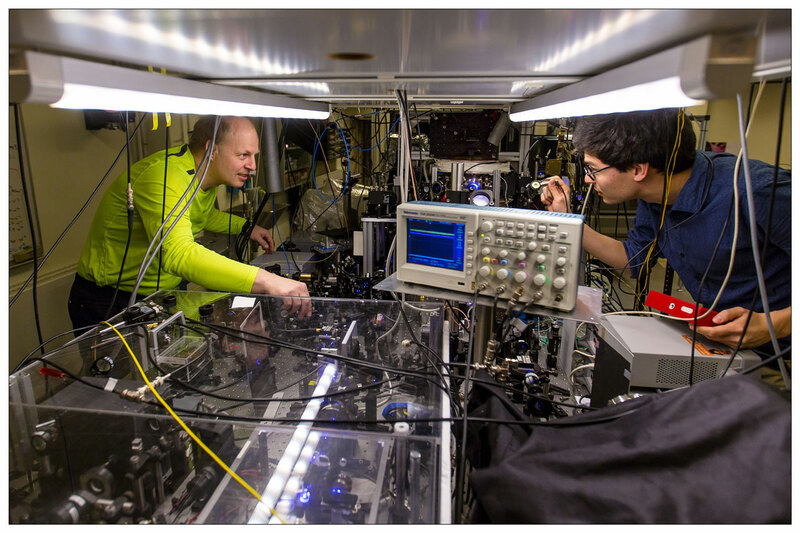 The ultra-precise atomic clocks could be used in both basic research and satellite navigation, as well as for metrology (measurement methods for determining units of measurement). It is this world of quantum optics that Jan Thomsen manages to make understandable with great communicating skills and enthusiasm. “Jan masters like no other the art of integrating demonstration experiments into lectures. His heart bleeds for the experiments and physics boils in our minds in every lecture, precisely because he challenges the students both theoretically and experimentally. In Jan’s hands, even the most delicate optics experiments work every time and it is impossible to not get carried away when you are met with world-class experimental craftsmanship,” say the students in his courses. Jan W. Thomsen will receive the Teacher of the Year award at a reception on July 1 at the Niels Bohr Institute on Blegdamsvej. The award of 25,000 kr. is being given to Jan W. Thomsen for his contributions to the Faculty’s high quality of teaching. In addition, 50,000 kr. will be awarded to his team for teaching related activities.